first up i have to apologise for disappearing from the blogging world. sometimes real life gets so busy and once you've fallen behind it feels pretty daunting trying to get back on top of blogging again. luckily most of what's kept me busy has been good - my brother's wedding and all associated family activities, between 2 and 5 gigs every week, and some HUGE plans that i can't really talk about yet. so thank you to everyone who has stuck with my little blog, and to everyone who has subscribed even during this quiet time, welcome! 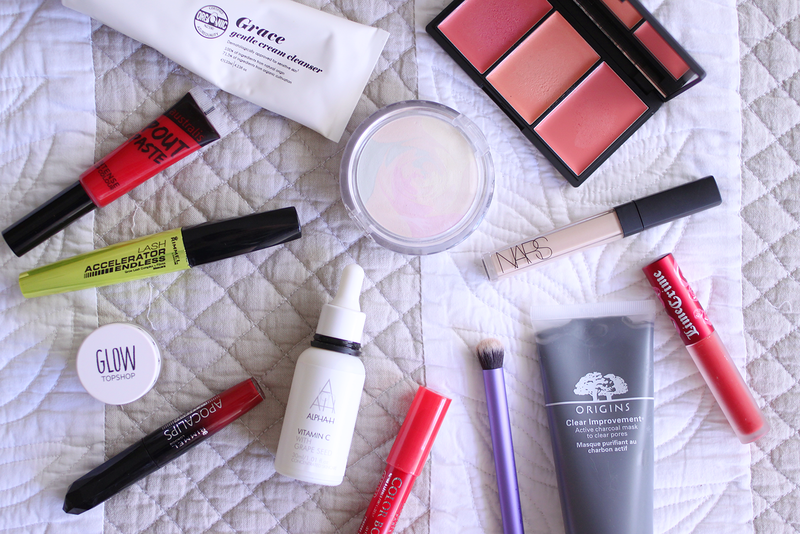 :) i've decided to get back into things by talking about some products i've been loving this year. a lot of bloggers post their monthly favourites but since it's a little late for that i thought i'd do my favourites from the first quarter of the year (scary!) because everyone likes a good product recommendation or 13, right? sleek blush by 3 palette in californ-i-a ($14.99 US) i've talked about my love for sleek blushes before so when is saw they'd launched two new blush palettes (the orange-y coral californ-i-a and rosey pink lemonade) i ordered them both straight away. a lot of sleek's shades can be too deep for my super pale skin but these two palettes are perfect for fair-skinned girls. californ-i-a has all cream blushes, while pink lemonade has two powder and one cream. both their cream and powder formulas are really high quality, strongly pigmented and easy to work with. and the shades in these two new palettes are so wearable and slightly more muted than their usual bright offerings - if you're thinking about trying something from sleek these palettes won't disappoint! physician's formula mineral colour correcting powder in translucent ($13.39 US) another product that's great for fair skinned girls. i can get quite shiny in my t-zone throughout the day so i always have some powder on hand to top up, especially as i go out after work several nights a week. i do like the powder i keep in my bag to have a bit of coverage for that reason, but i've found a lot of powders can make me look a bit on the orange side, so here's where this comes in. i think if you have a darker skin tone or if you prefer to look tanned then you might find this leaves a white cast on your skin, but since i have no fear of that, this suits me perfectly. it's colour correcting and i really can notice it blurring imperfections on the skin. definitely check if out if you're after after a powder that adds coverage but not colour. NARS radiant creamy concealer in vanilla ($35.00 AU) this has got to be one of the most hyped up products around but after using it i can see why! better than any other concealer i own, it's super high coverage but doesn't cake up and it's perfect on blemishes and under the eyes. and another thing i think is great, it retails for $35 from Mecca Cosmetica in Australia and $29 US in the states, so there actually isn't a huge markup on these. lime crime velveteen matte lipstick in red velvet ($20.00 US) now this is how to do a matte liquid lipstick! not only is the shade and packaging lovely, but the formula is too. it's super long-wearing, but it also fades really cleanly so if you eat while wearing this it'll disappear completely from the middle of your lips but still stay near-perfect on the outside. so when you top up you only have to add product to wherever it's faded rather than build up product all over your lips, which i find makes them dry out. real techniques base shadow brush ($18.00 US for a set of 5 brushes) i never hear a bad word about real techniques brushes, and it's for a reason. they're affordable, versatile and great quality. i picked up their base shadow brush as part of their eye brush set, and i love it for applying a cream base to my eyelids. i used to use my fingers but since i have long nails it's hard for me to get a neat application without poking myself in the eye, so this brush works really well for me. bourjois colour boost lipstick in red island ($11.88 AU) of all the brands releasing lip crayons, i think these bourjois ones might be my favourite formula. they're super creamy and comfortable on the lips, all the shades are lovely and once you've put on your first application, they're the kind of product you can touch up without really needing a mirror. i also find that that these stain the lips so when they fade it's not a total mess which is always a plus. when these were launched last year they brought out four shades and now they've added two more including this deep red, so naturally i had to add it to my collection as soon as i saw it. rimmel apocalips lip lacquer in across the universe ($12.85 AU) like the bourjois lip crayons, this is a new shade in the expanded line of apocalips lip lacquers. i love the formula of these, they're super pigmented, glossy without being sticky, and they last forever on the lips. this is a beautiful deep red shade that the line was missing and i've been loving it ever since i bought it. topshop glow highlighter in polish (£9.00 / $18.00 AU) now i've been pretty faithful to my mary lou-manizer since i bought it but i wanted to try out a cream highlighter and this one has received its fair share of hype. i just dab a bit of it on my cheekbones, down my nose and on my cupids bow and it adds a really pretty subtle glow to the skin, the only downside is that it's in a pot, which can make it difficult to get product out with long nails. rimmel lash accelerator mascara in black ($14.99 AU) this is a mascara i wasn't really all that impressed with when i first used it, but after trying a few others and coming back to it i've decided i love it. the formula contains micro-fibres so it really lengthens your lashes and makes them super black and the bristles on the wand are quite spaced out so it doesn't clump your eyelashes together, which is something i really don't like about other mascaras i've tried. australis pout paste in love bites ($12.95 AU) and for my fourth and final red lip product (oops) this is a highly pigmented, non-sticky gloss in a really bright juicy red shade. it's actually the only shade i like from the line but it's worth checking out if you're in australia and can get your hands on it. antipodes grace gentle cream cleanser ($47.50 AU) i know this is an expensive cleanser, i actually picked it up in the post-christmas sales with the antipodes hydrating toner and moisturiser for less than the price of the cleanser on its own, but it really is one of the nicest cleansers in my collection. the formula is so rich and creamy (duh) and it gently removes any makeup that might be leftover after my balm cleanse at night. if you want to splurge on a nice, organic cleanser with no parabens, sulfates, etc this is a great option. origins clear improvements active charcoal mask ($34.00 AU) i've loved this mask for a while now, but recently i've started using it as an overnight spot treatment on blemishes and although it doesn't magically make them disappear, it definitely shrinks them down and helps to absorb all the gunk that's hiding below the surface. and of course it's great as a clarifying all-over face mask too. alpha-h vital c serum ($89.70 AU) i had a facial at the start of march before my brother's wedding and while talking skincare with the facialist she said i should try a vitamin c serum to help fade acne scarring and pigmentation. i already had this guy in my stash (adorebeauty offered a choice of serums free with purchases over $100.00 a while back) but i hadn't been using it consistently enough to see results, so i decided to include it in my morning routine everyday and i've definitely noticed a difference. scars that i've had for a while have finally all but disappeared, and while some newer ones are still hanging around i'm trusting this to get rid of them more quickly. do you have any stand-out products of the year so far? I absolutely love the Sleek blush palette! The Antipodies cleanser sounds gorgeous too. Oooo that coral colours in the sleek palette looks absolutely perfect! I've been a little disappointed with the benefit blush I'm currently using, so might have to replace with this given all the praise people are giving Sleek ! A big welcome back, babe! I missed your posts a lot! I'm glad life has kept you busy in a good way and that you've been enjoying yourself. I guess when you're that busy, the last thing you want to do is blog as we all need some down time to ourselves. The NARS Radiant Creamy Concealer is such a beautiful product! It blends like a dream and really does add radiance. I actually use my Real Techniques Base Shadow Brush for this! I still prefer using MAC Studio Fix Concealer for blemishes, however, as that stuff pretty much acts like an eraser. If you like liquid lipsticks, check out the Hourglass Opaque Rouges! They're seriously incredible. I own the shade Icon and it's the most beautiful, sultry red. I really wanted to check out some Lime Crime products when I went to Sydney IMATS, but it was way too crowded. They looked like they had some gorgeous stuff. You must try the Antipodes Reincarnation Pure Facial Exfoliator next! This is also really rich, gentle and creamy and like no manual exfoliator I've ever used. I find it really refreshing and hydrating, and when you scrub it in, it doesn't feel like you've taken a few layers of skin off! I really want to try more by them. How have you been going with your bottle of Estée Lauder Advanced Night Repair? I swear by this stuff to fade acne scars. It just COMPLETELY changed my skin and I use it religiously every night. thanks lovely!! it feels good to finally be getting back on top of things a bit, haha. it's long overdue. i've heard so much about the studiofix concealer as well as the pro-longwear concealer, i really want to try both of those but at least for now i'm loving the NARS one. yeah i've heard the hourglass ones are amazing, definitely check out the limecrime ones if you can, i bought mine from urban outfitters so it's not really the same as testing the products out in person at IMATS but they're not crazy expensive and urban outfitters has a pretty decent beauty selection. ohh wow,that sounds awesome! i'll definitely have to keep an eye out for that next time i need a scrub, i've started to see antipodes being carried in priceline lately which is going to be great when they do their 40% off skincare sales! you're so right about the ANR, i haven't been using it every night but i do really want to get into a routine with it because i think i'll see even better results with regular use, but i do really notice a difference even from using it a few nights in a row or if i have any dryness it really sorts it out. such a great product! I use the Physisian's Formula translucent powder as an under eye setting powder for my concealer and it works really well! I find it helps to tone down the color of the concealer and locks everything into place. it's such a great powder! i love it for touching up but without changing the colour of my foundation, i wish more companies made powders like it. It's awesome to see a new post from you, darling gal. Your reviews of beauty and makeup products are always highly engaging (and dangerous for my wallet ;D) and leave me yearning to try at least one new item that you've shared with us. Today, in the case of this great post, that is the Lime Crime lippy in particular. While I'm a devoted MAC lipstick fan, especially to my Russian Red, I have heard so many marvelous things about Lime Crime that it's become the cosmetic brand I'm most itching to try next. Perhaps the birthday fairy (aka, Tony :)) will pick up on my hints and deliver one of these lovely offerings my way this summer (fingers - or would that be lips? - crossed!). I seriously need that Nars concealer so badly, ugh! Good to see you posting again! I completely understand - real life is quite hectic. I don't wear any makeup myself, but lately I've been investigating different brands to see what I can use for photoshoots. I'll definitely investigate some of these you mentioned!